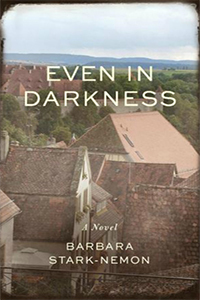 April 24, 2017 – This week’s episode airs on Holocaust Remembrance Day, and features debut novelist Barbara Stark-Nemon’s ambitious novel, Even in Darkness . Spanning a century and three continents, Barbara tells the story of her real-life great-aunt, Kläre Kohler, from early years in a prosperous German-Jewish family, through an adulthood of love, two World Wars, a concentration camp, and an unconventional life in post-war Germany. Barbara earned an undergraduate degree in English literature and Art History — and a Masters in Speech-language Pathology — from the University of Michigan, which led to a teaching and clinical career. But all along, she’s wanted to tell a story — and readers are fortunate that she did, as evidenced by the stack of awards Even in Darkness has racked up since publication. You can find our guest at BarbaraStarkNemon.com, @BStarkNemon on Twitter, and Facebook.com/StarkNemon.